Last week, Addison's mom Jen asked, "I have some squid left over, would you mind if I dissected some with the kids?" It's not a question I'd ever responded to before, nor do I expect to again. 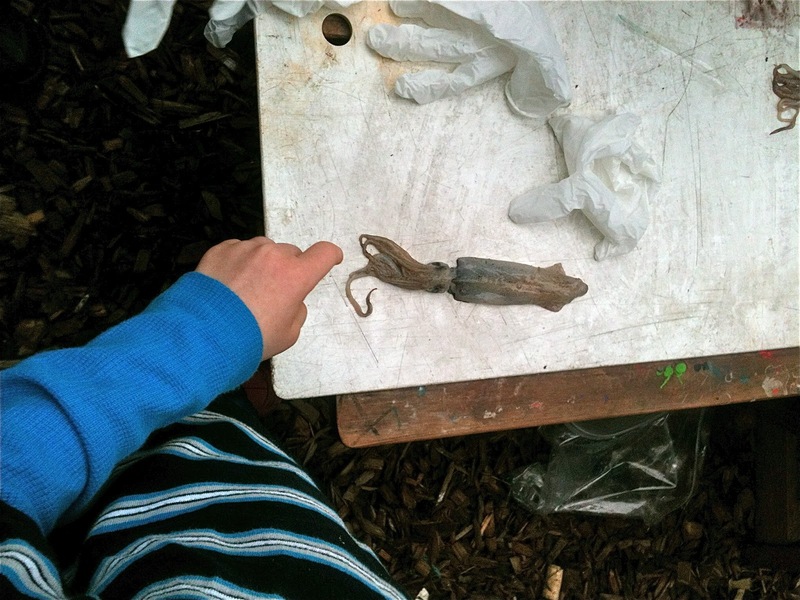 The nonsequiter of "left over squid" and the fact that I'd only just the day before been thinking of my own first exposure to the creatures as a boy during the time my family spent in Greece, made the question at first seem both incomprehensible and a bit like a mind-reading trick. After a moment to allow the question to find a place in my brain where it could be at least partially comprehended, I answered, "I think that sounds cool." 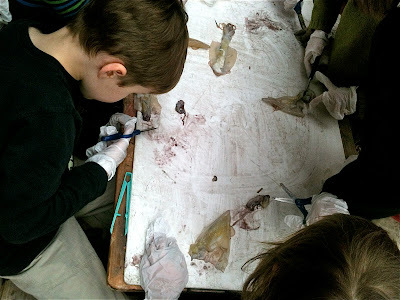 As it turns out, their family are a members of a homeschool group that has been studying mollusks of all sorts, including squid, and had earlier in the day undertaken a dissection project. One of the beauty parts of being a cooperative is that not only were we being offered the left over squid, but Jen was going to be there to manage the project. She asked for a few extra pairs of scissors and they went to town cutting into the bodies on the closed lid of our worm bin. 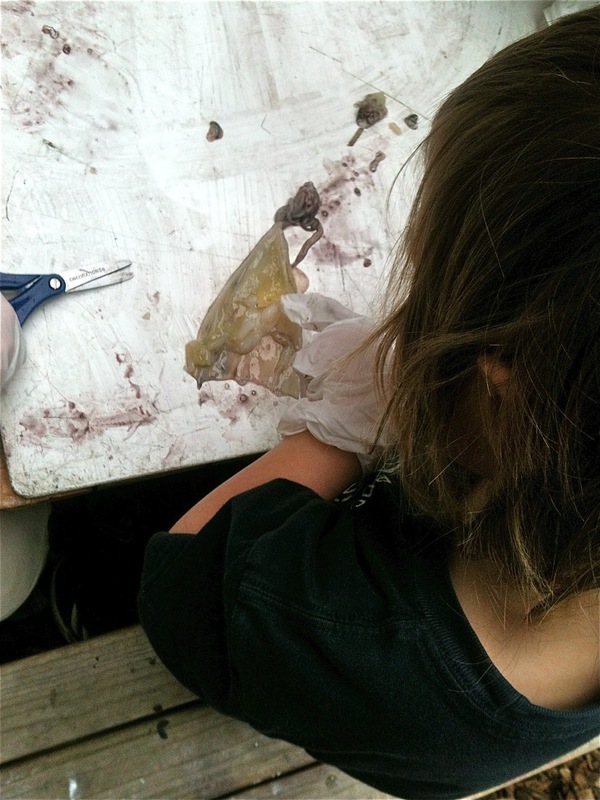 Only a few of the kids were willing to touch the fascinating creatures until she offered gloves. As the kids hacked away, Jen began naming the body parts for them, pointing out the beak, the pin, and the ink sac. It was pretty impressive, in fact, as the most of the kids were more focused on undertaking such gruesome tasks as lancing the eyeballs and severing the arms and tentacles. It was a bit of a free-for-all, but in a good way. 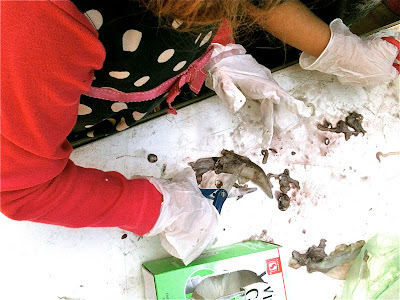 She later told me that the homeschool group, which skews a bit older than our 5's class, had undertaken a much more step-by-step, scientific approach, starting with diagrams, then at least attempting a "proper" dissection in which they opened the body and took time picking out the key features. By the time we were done, I knew I wanted to give it a second go, this time with a little more information behind our effort. 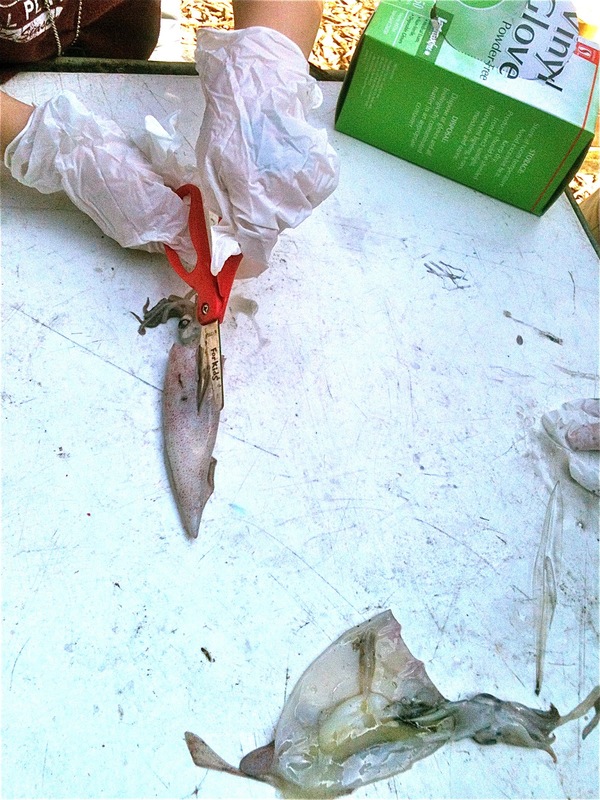 I worried that acquiring dissection squid would be a complicated and/or cost-prohibitive thing, but as it turns out that around here, at least, one can buy 3 lbs. 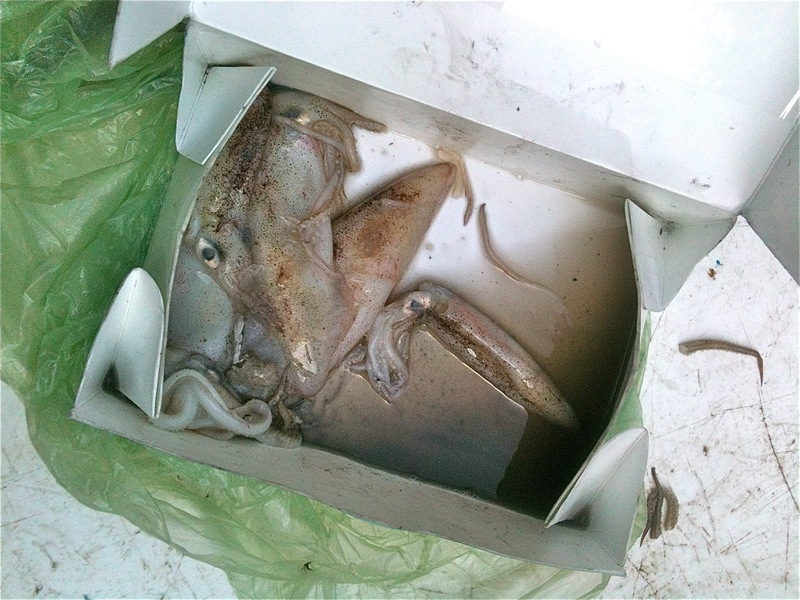 of frozen whole squid at an Asian grocery for under $8. Nice. Jen sent me a couple links to the diagrams (here and here) they had referenced, and being the low-tech kind of school we are, I used a Sharpie and butcher paper to recreate a larger exterior and interior diagram. 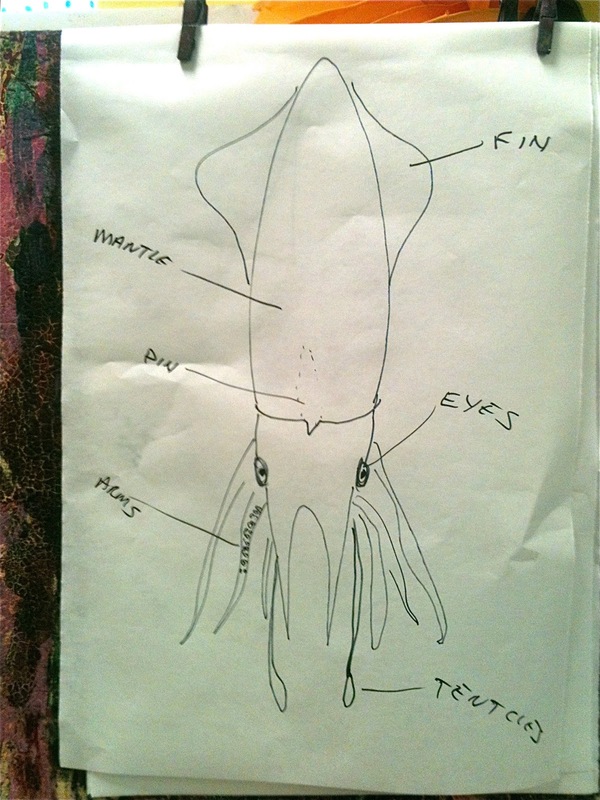 She also loaned us a couple library books with pictures, mostly of giant squid, in action. 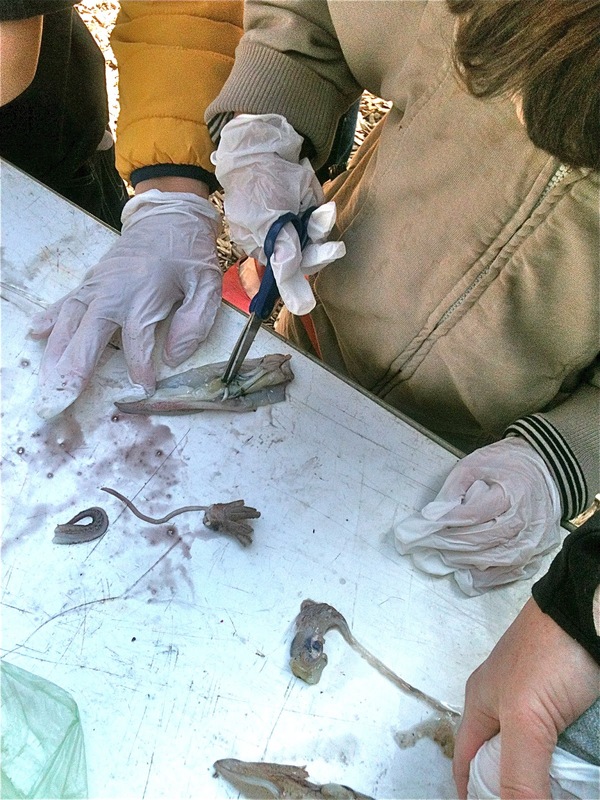 The memory of our first dissection session fresh in our minds, we had a more theoretical discussion about squid. We talked about how they moved about in the water by a kind of jet-propulsion (which was a great call-back to our recent visit to the Museum of Flight); how the used their tentacles, arms, and beaks to catch and eat their prey; how they used their ink to blind their enemies as they escaped. 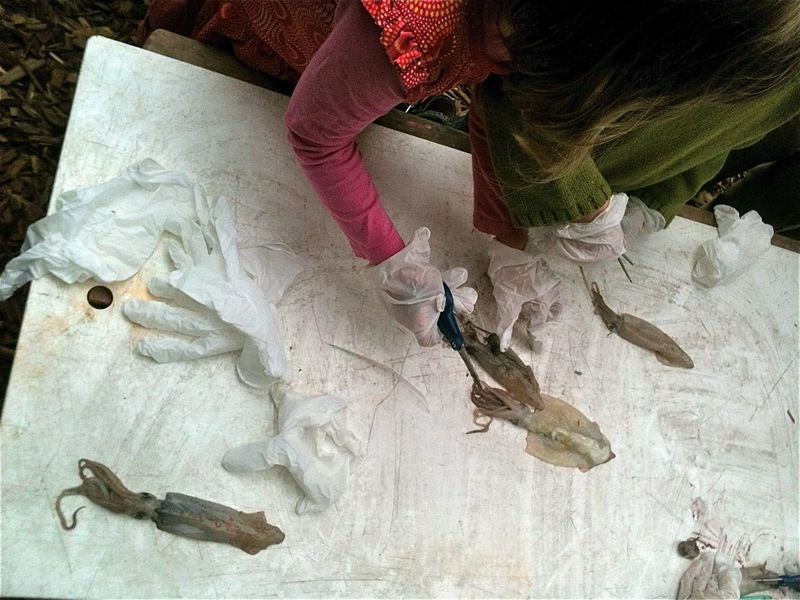 Some of the children, like Addison, already had a store of knowledge, so they lead the discussion, dropping in bits of extra information as we constructed our own learning about squid. 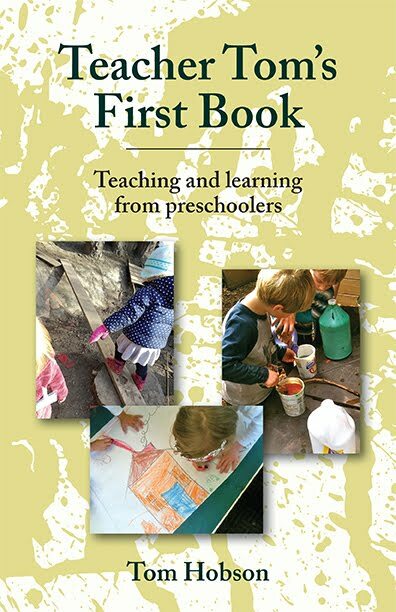 This is how I like to use "classroom sessions" like this, not as an opportunity for direct instruction, but rather sharing our previous experience and knowledge by way of getting everyone on the same page, sandwiched between a couple of hands-on activities. We then walked through my diagram, labeling the parts we were hoping to find, both inside and outside our squid bodies. 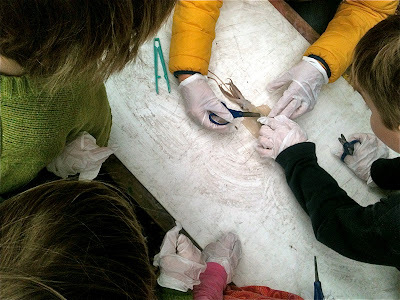 I asked Jen to once again lead the session, this time by demonstrating a dissection and pointing out the points of interest before turning it over to the kids. We were slower this time, more deliberative; we asked more questions like, "Is this one a boy or a girl?" and "Is this the ink sac?" We made comments like, "I found the pin!" and "I think this is the heart." There was still a certain amount of hacking away, but it seems we got some of that out of our way the first time through. What a genuinely great exploration. My only disappointment was that none of the kids were interested in using their ink and the pin (which looks like a piece of clear plastic with a point on the end) to try making a drawing. Maybe next time. In the meantime, the cover of our worm bin has become quite a popular hangout for flies.